A group of astronomers from the “International Scientific Optical Network” (ISON for short) discovered Comet ISON on 12 Sept 2012. When first discovered, the comet was much brighter than scientists expected for being well beyond Jupiter’s orbit. Astronomers quickly measured its path and calculated it orbit. They discovered that the comet would dive close to the Sun in November 2013. Because of its close approach to the Sun and its brightness at such a far distance, some scientists speculated that it may one of the brightest comets to ever grace the sky—certainly one, if not the brightest comet, of the current century. Its brightness is what gets people excited. Now a comet’s brightness is notoriously difficult to predict. Back in 1975, scientists predicted that Comet Kohotek would be a spectacular comet. It fizzled—it was just barely visible to the unaided eye. On the other hand, Comet Hale-Bopp was not predicted to be a spectacular comet. It was. As a result, astronomers have tried to not get people’s hopes up too high (I don’t think they succeeded). ISON will be a “Sun-grazer”, meaning it will pass through the outer layers of the Sun (its closest approach to the Sun is November 28th). It might not survive passage through these layers of the Sun. If it does, however, it should be a pretty bright comet during the month of December. The November issue of Astronomy magazine is dedicated to comet science in general and Comet ISON in particular, which I highly recommend for additional information. As a comet approaches the Sun and develops a tail, it also sheds small particles of itself. These particles stream out behind the comet and form a debris stream in the comet’s orbit. The following recipe makes a scientifically accurate model of a comet nucleus. 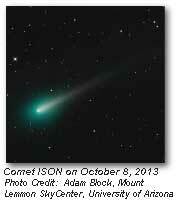 Comets are made of frozen water, ammonia, organic (carbon-based) material, and silicates (dirt). SAFETY WARNING: Dry ice is -110 degrees F. Even brief exposure will cause “burns.” Always wear gloves to protect your hands, and safety goggles to protect your eyes. Line the mixing bowl with one of the garbage bags. In the large plastic bowl mix together the 2 cups of water, half of the dirt, all of the syrup, and the ammonia. Put on your gloves and goggles. Place your dry ice in a double plastic bag. Wrap it completely in the cloth towel and put it on the ground. Use the hammer to smash the dry ice into tiny pieces. Pour the crushed dry ice into the mixing bowl with the water-dirt mixture. It will make lots of vapor! Use the wooden spoon to stir the mixture. Keep stirring until it gets thick. Using gloves, pack the slush (still in the plastic bag) into a ball. Keep packing until you have a solid frozen lump. Remove the lump from the plastic bag. Sprinkle more dirt onto your comet. Pour water over it until it has a frozen layer of water all over it. 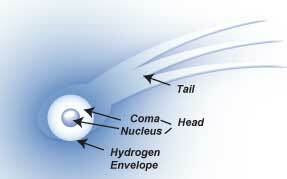 You have made a comet nucleus. Watch it hiss and pop as the dry ice sublimates from a solid to a vapor. You can speed up the process with a hair dryer. Your comet nucleus is most impressive outdoors in bright sunlight where it may form a small coma or vapor cloud around itself. Carry (with gloves!) your comet around and see if you can see it forming a tail.